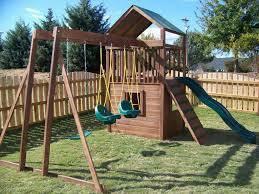 Houses & Homes VA: Are You Certain that Your Child’s Playground Equipment is Safe? Are You Certain that Your Child’s Playground Equipment is Safe? It’s every parent’s dream to get our children everything that we didn’t have when we were growing up. We want our kids to be happy and to have fun. Sometimes in our excitement we might not do all of our homework. It’s understandable really. There have been times that I think I was just as excited as the children were when I had gotten them a special surprise! I have always loved those outdoor playgrounds that you can buy at the home improvement centers or those great little open air shops on the side of the road. I still do. Here are a few things to consider when the time comes to surprise your little ones. If you already have some of this equipment for the kiddies you might want to check it out as well if you haven’t done so already. Naturally your little one is going to take a spill every once in a while, It’s all part of being a kid. One thing that many parents fail to consider when buying playground equipment is what type of surface it will be sitting on. Sure, I’ve seen them set up on grass many times but I’ve also seen kiddy playgrounds set up on asphalt or concrete. It’s OK if this is the only place that you have to place the equipment but why not provide a soft landing spot for the children as well? Wood chips are an excellent material to put over a hard surface to provide at least some cushion, foam is even better. If cost is a factor than the wood chips are much better than nothing. Just be sure that the toddlers don’t put them in their mouths. Playground equipment requires periodic maintenance just the same as anything else. Bolts become loose, nails rust or may be sticking out and wood can rot. Take the time to inspect the equipment that your children are playing on to be sure that it is in good condition. If they like to visit a local school or park playground check it out as well. If repairs are needed be sure to inform the proper person(s) to have it fixed. Use common sense when allowing the kids to play. Don’t allow them to climb higher than you are comfortable with, or better yet, higher than you want them to fall. As always, be certain that the equipment that they are climbing on is sturdy and will not break or move in any way. The overwhelming majority of playground injuries are a direct result of falling. This is one situation where close supervision is always required. Swings are the one thing on a playground that can hurt someone that is not using it. It happened to me when I was a child. I received a good swift kick to the back of my head because I walked too close to the swings. Make sure that your children give a wide birth to the swings and if they are the one using it be sure to check the chains, rope or cord that is attached. Obviously a lose fitting or frayed cord or rope is completely unacceptable. Also take the time to check the fittings, bolts, screws, everything. If you’re not 100% sure than don’t allow your child to use the swing. There’s plenty else to enjoy. Is the play area fenced in? It should be. Children tend to wander when they play and it is always better if they are within a contained area. Cars, stray animals and strangers belong on the other side of the fence. Have you ever had to slam on the brakes in your car near a play area because a child was chasing a ball? I have and I can tell you it’s a heart-stopping experience. Naturally there is nothing than can replace competent adult supervision but following these steps should go a long way to ensure that your child can safely enjoy that new swing set, sliding board or “Jungle Jim”!